Most traders know what Fibonacci retracements are but you don't hear very many of them talking about Fibonacci extensions (at least I don't). If you have never heard of them, then get out a pen and some paper. What is a Fibonacci extension? Well, we know that a retracement is a move in a stock that "retraces" a portion of the previous move. Usually a stock will retrace at one of 3 common Fibonacci levels - 38.2%, 50%, and 61.8%. 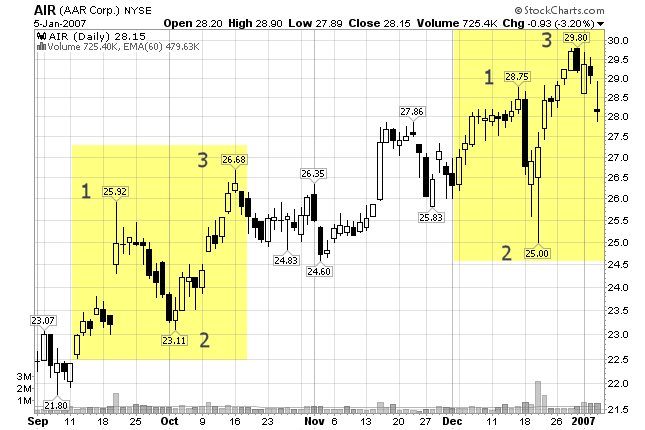 In the first example, AIR pulls back from $25.92 (1) to $23.11 (2). It then rallies above that swing point high at $25.92 (2). So this stock has recaptured more than 100% of the move from 1 to 2. It then tops out at $26.68 (3). Could we have known that this stock might run into resistance at $26.68 (3)? Yes - If we calculated a Fibonacci extension ahead of time. $26.68 - the exact high at 3. That is the Fibonacci extension. $28.75 - $25.00 = $3.75 x 1.272 = $4.77 + $25.00 = $29.77. We are off by three cents here. So, if you buy pullbacks and you are wanting to take partial profits on a stock, you can calculate this ahead of time. Note: The two common Fibonacci ratios used for calculating extensions are 1.618 and 1.272. There are others but these seem to work the best. Microsoft actually reversed at $26.76 (3). Close, indeed. Now, let's look at the next one on the same chart. 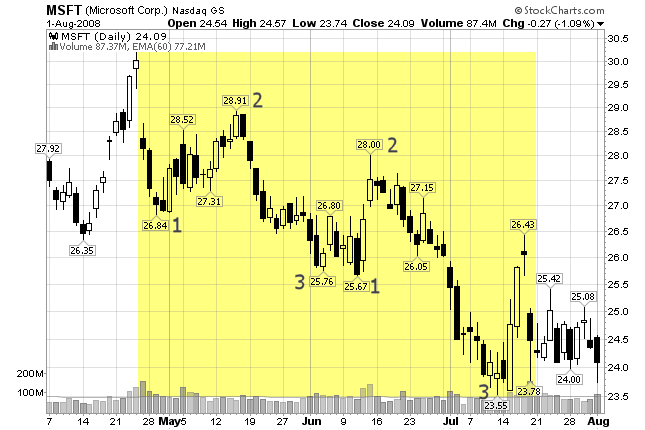 Microsoft actually reversed at $23.55 (3). Not too far off. Calculating Fibonacci extensions work best when stocks are at new highs or new lows - where there aren't any obvious support or resistance levels on the chart. So, if you are long a stock and it begins to make new highs, and you want to take profits, you can calculate the extension levels to get a general idea of where it may begin to fall. Same thing on the short side. If you are short a stock, you can calculate the extension levels to get an idea of where the stock may begin to rally. Then you can decide if you would like to cover your position at that level. But you should never base any decision to buy or sell a stock based on Fibonacci alone. Wait for candlestick patterns (price action) to develop and confirm that the stock may indeed reverse at your target price.